June 11th, 2012 (9:06 PM). Edited June 11th, 2012 by Halfcadence. 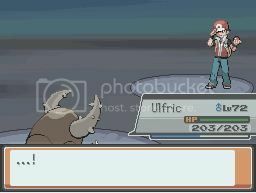 -Realized Bullet Seed wasn’t the item behind the bush on Route 104 but obtained from the guy by the flower shop. Taught it to Scherzo nonetheless. -Sailed to Dewford and went to Granite Cave where we saw the return of our good friend Horace the Abra! 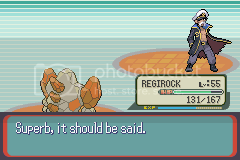 -Horace then proceeded to utterly decimate Brawly and his Gym. Taught Makit Bulk Up. -Got up to Mauville and tried to take on the Gym right away. Big mistake. -While training up on the routes around it, Makit evolved into Hariyama, who then proceeded to take on Wattson by himself. Taught Horace Shock Wave. 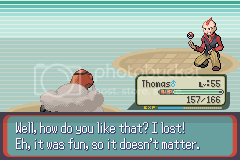 -Winona was actually pretty tough, ended up coming down to Thomas using Iron Defense. 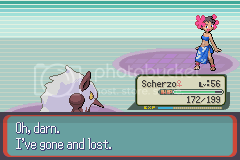 -Found the Leaf Stone on route 119 and evolved Scherzo into Shiftry. Taught him Aerial Ace. 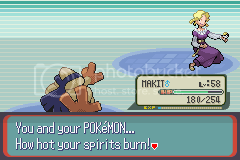 -Dealt with some Team Magma Things at Mt. Pyre and their hideout. -Scherzo, Makit, and Horace took out Wallace with little issue. 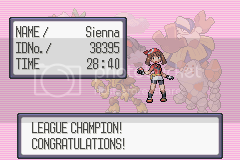 -Victory Road was actually kind of rough to get through.